Happy spring, Homesong readers! I have waited SO LONG to type these hopeful words in this little online home of mine, to let the reality that spring has arrived calendar-wise sink in, and to breathe and bathe in the new growth and life surrounding us. Do you hear the birds where you are? Listening out the window high up in my writer’s nook. I hear them singing, calling out to one another from much higher up than I, “It’s here, it’s here” they say. Welcome home, little ones. Speaking of new growth, the five of us spent a lot of time outside this past weekend for St. Patty’s day, and I noticed some of the lemon balm I transferred a few years back starting to dig its way out of the earth! I about cried. If you have a hard time growing herbs, or anything for that matter, plant lemon balm. It’s easy to grow, comes back thicker and fuller every year, and is lovely in more ways than I can count: in salad dressings, tossed with roasted vegetables, and in herbal teas to name a few favorite. I snip and dry ours throughout the growing season above our island in the kitchen and drink it in sun tea year round. It’s medicinal properties help calm and balance the body, and it’s delicious with sliced lemons. Anyway, it was such a welcomed sight to see those little green leaves amidst the browns and grays of the late winter mud. I also noticed that the buds on our lilac bush are coming in too. Bless it. Bless it all! Now that growing season us upon us, I thought it would be fun to share some of our favorite gardening books with you all, given that this community is one who loves to read! Books about nature and growing and the natural world are our favorite to collect and read, and our botanical library has grown quite a bit over the past few years. An avid reader myself, I too enjoy pursuing the ol’ gardening book from time to time, giving my eyes a rest from the digital world and a peek into worlds created on paper. 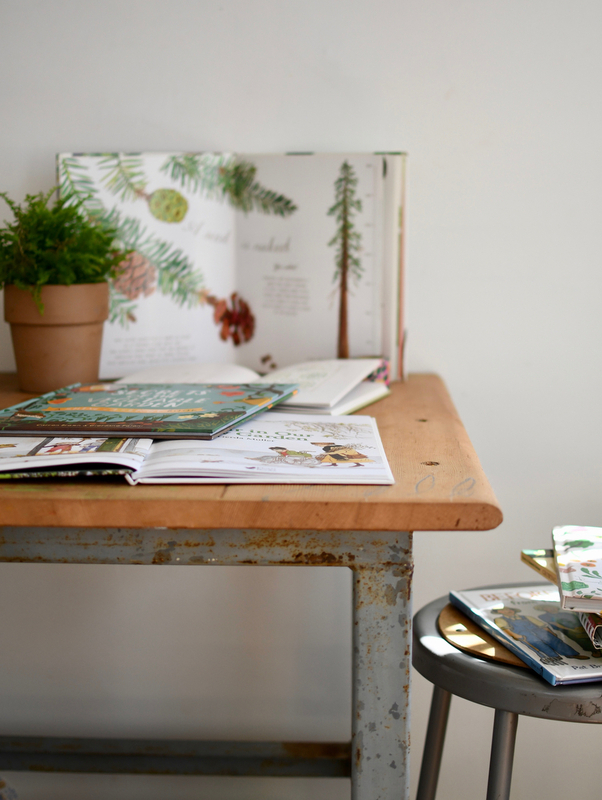 The books below I am sharing with you are as informational as they are beautiful, offering heaps of garden inspiration for both little ones to explore and myself as a home gardener. This year we have plans to expand our garden quite a bit by making (and charring) many new raised beds! Right now we have a total of four, and hope to at least double it to increase our harvest, along with trying new varietals of edible plants and flora. We want more berries and sunflowers, along with the usual veg like tomatoes, peppers, zucchini, herbs, and a variety of greens. Next week I am going to gather the timber and begin the charring process, more details to come about this project, so stay tuned for that. In the meantime, go put holds on these lovely books at your local library, or stock up on a few for Easter baskets. Each one is a gem. The Tiny Seed by Eric Carle | This classic story is about the life cycle of a flower told through the adventures of a tiny seed. It is thoughtful and vivid, a perfect cardboard book for beginning gardeners. Planting a Rainbow by Lois Ehlert | This colorful book takes the little reader though a rainbow of colors, showing the beauty and wonder of the garden. How Does My Garden Grow by Gerda Muller | This wonderful book is full of charming illustrations about Sophie and her vegetable garden through the bounty of the seasons. All of Muller’s books are classics we return to again and again. Up in the Garden and Down in the Dirt by Messner | This imaginative read explores the hidden world below the garden and within it through the course of a year, showing the critters and creatures that make the earth (and our gardens) their home. 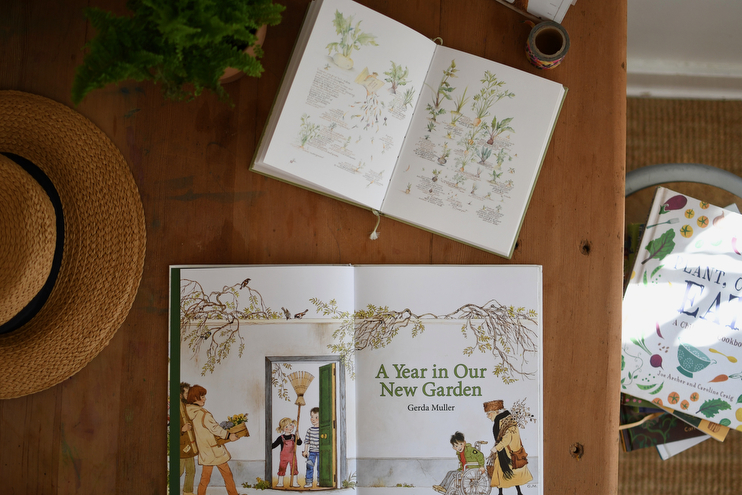 A Year In Our New Garden by Gerda Muller | Another book by Muller, this charming story is about Anna and Benjamin who have just moved to a new house and plan to plant the perfect garden. Throughout the pages you can also find gardening tips and home-grown recipes encouraging little ones to get outside and explore the natural world around them rain or shine. A Seed is Sleepy by Dianna Aston | This poetic children’s book is just as beautifully illustrated as it is written, offering children a detailed look at the complex world of seeds and their place in the growing cycle. 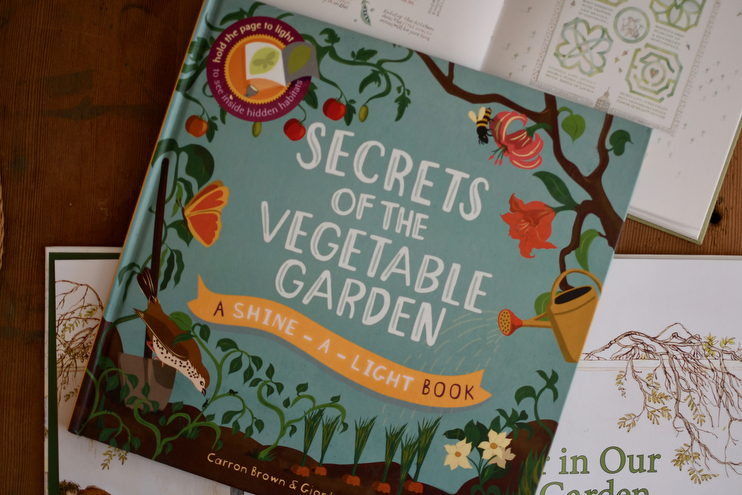 Secrets of the Vegetable Garden (Shine a Light Book) by Miller | This interactive shine-a-light book is a fun way for little readers to see what is living between the leaves and stalks and stems and soil of a garden. It’s just as informational as it is engaging, a great option for your gardening library. Before We Eat by Brisson and Azarian | This behind the scenes farm to table book beautifully illustrates the distance food travels before we eat it at home, along with the integral chain of individuals who make eating our food possible. Gardening Lab for Kids: 52 Fun Experiments to Learn, Grow, Harvest, Make, Play, and Enjoy Your Garden by Brown | This creative book is a wonderful resource full of fun ideas that encourage outdoor learning and play through gardening. There are 52 plant-related activities set into weekly lessons that would be a wonderful companion to any nature-based homeschool curriculums. Plant, Cook, Eat! : A Children’s Cookbook by Archer and Craig | This is more than cookbook, although it is certainly a lovely one, but also a beginner’s gardening companion teaching little growers how to grow and prepare delicious food at home. Plus a Few Extras I Couldn’t Help But Share! A Book I Want: We Are the Gardeners by Joanna Gaines | As soon as I heard about this book and saw the illustrations I knew our family would love it. Already got ours pre-ordered for a certain someone’s Easter basket! A Book I Treasure: In and Out of the Garden by Sara Midda | This darling little garden companion is for the mama growers, and I so enjoy thumbing through it each year. Sara’s soft and whimsical illustrations are such a breath of fresh air. We love A Seed is Sleepy! What books would you recommend for someone just starting a raised bed garden? Total beginner here, but dying to jump in.